At 11:15 pm the sun set behind the mountain, which is almost just a hill. Not long after, I decide to go to rest, although there is still turmoil in the camp site. Some children are noisy - but not close - closer are some women who talk out loudly. Italian I think. Just as I am well on my way to dreamland, it rages heavily in the tent. As if one fell over a battle. I just have none. Not fastened at least. Could it be a sudden wind shock?? Now it's beginning to dawn on me .... I forgot to put the sticker on the tent yesterday. Oh, I forgot to put it on, I have it here. How many are in the tent? Oh, you think it's big? It's just me. And finally, at 01.30am, I can really sleep. I can not help myself from laughing, but at the same time I am a little upset. Why should I be woken up THREE times? At 7 am I'm up for a shower. Both stalls are busy, but it does not take long. Again it's this is sulfur smelling hot water. They have separate piping for hot and cold water. It is probably the same hot water that they use for heating? 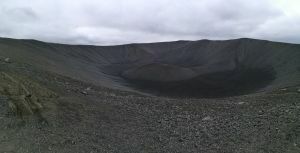 It's grey and no wind moves, but to the west, just after the crater, it's as if the clouds spread. Like ysterday, when the blue sky was exactly there. Then I thought there was something magical around Myvatn. There is definitely not today. Soon there's a drizzle. But very little and not long. 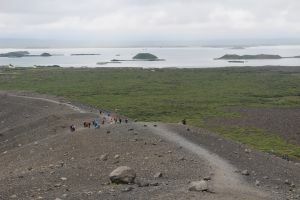 I go to book my tour to Askja tomorrow. It's done. When you buy here you pay 23,000, but get 1000 left in money. Money that is not quite white. When I say that I will complain and tell her the story from tonight, she has a good laugh. It was the owner and he is obviously an old miser. Not only does he render at night to bother fare dodgers, he also has shady agreements and hires eastern European staff. The girl at the reception is from Latvia and another employee speaks another Eastern European language. 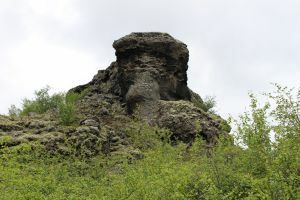 I first go to Hverfjall (pronounced [kværfjatl]). A gravel pile of more than 1 km diameter and 100 m altitude. With a hole in the middle. That is, an extinct crater. 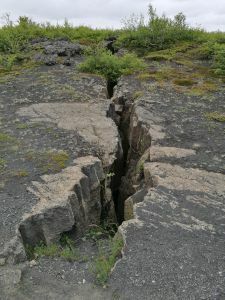 You can walk up and all the way around the edge. 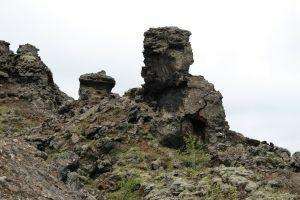 Afterwards, I continue to Dimmuborgir, a larger area of rare lava formations. They are really peculiar. I'm not there for long. There are trails of many colors. I only walk the blue and the yellow. Here the road is paved. That's the main attraction. The other road was just gravel. I give up driving down to the south end of the lake. It's cold and although I enjoy driving without luggage, I need a day off the bike. And I have a lot to write on the computer. And the day passes quickly. 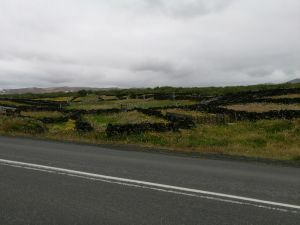 A few cyclists arrived from somewhere midway between here and Akureyri. I had not checked, but now I know that I do not have to drive in one stretch - more than 100 km.